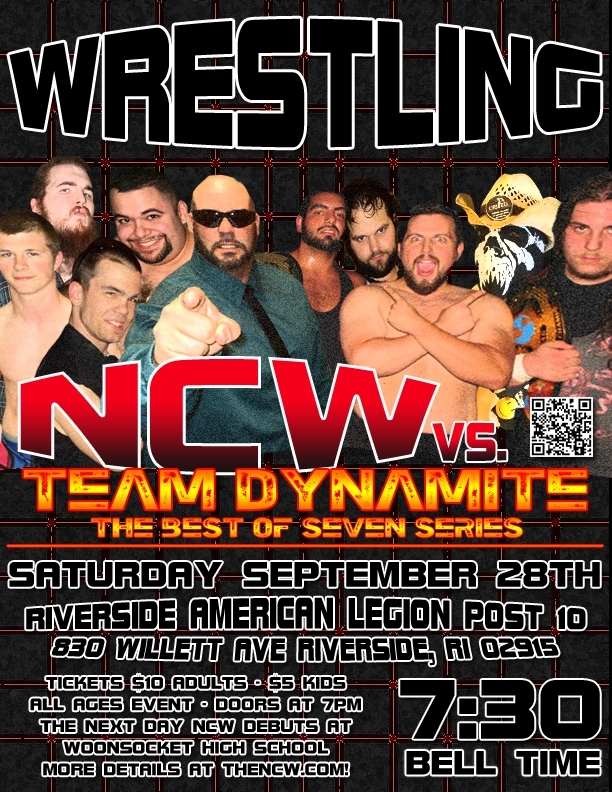 RIVERSIDE– Northeast Championship Wrestling’s 2013 season continues with a huge weekend of wrestling action kicking off at the American Legion Post #10 in Riverside, RI [830 Willett Avenue] on Saturday night September 28th for NCW vs. Team Dynamite! 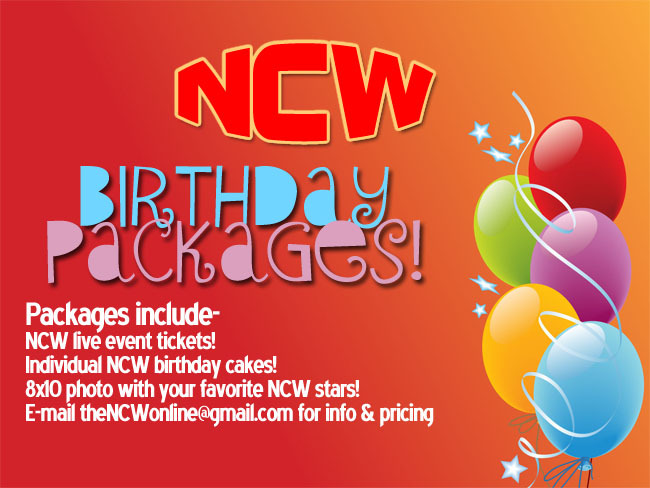 Competing in a seasonal format from February through November, for sixteen years NCW has presented a unique night of entertainment for fans bringing forth our larger than life characters, dynamic storylines, and incredible athleticism all while providing a unique experience for fans of all ages. Returning to the Riverside American Legion for the first time since March, NCW vs. Team Dynamite will feature a Best of 7 Series pitting Commissioner “Dastardly” Doug Summers and his crew of sympathizers versus the fan favorites of NCW who courageously support the former Commissioner—Dean Livsley. On September 28th the career of Livsley will hang in the balance when he puts everything on the line in the Best of 7 Series against Team Dynamite, if Team NCW wins he will finally get his one on one rematch with Summers December 14th at WrestleFest IX for NCW Ownership, whereas if Team Dynamite is victorious Livsley will leave the promotion once and for all never to return. With the battle lines drawn, Summers has enlisted NCW Heavyweight Champion “The Maine Event” Scotty Vegas to help him in his war when Vegas takes on the new NCW New England Champion Rob “The Giant” Araujo. The Warren, RI native picked up a huge win at NCW’s Big City Rumble earlier this month, winning the vacant title in a chaotic Four Corners Match after pinning Mike McCarthy. Can “The Giant” take his momentum and help Livsley turn the tide against Team Dynamite in Riverside? The reigning NCW Tag Team Champions the Inglorious Dastards (“The Beast” Brandon Behm & “Terrible” Tony Caruso) will also be helping their mentor “Dastardly” Doug on September 28th when they take on the Big Lovable Team of “The Portuguese Sensation” Ruy Batello & the Lumberjake in tag team competition. Also appearing in Riverside on the 28th will be NCW 2012 Rookie of the Year “All Good” Anthony Greene, Steve “The Turtle” Weiner, Rocco Abruzzi, Buddy Romano, Eddie Loomis, Pacifico, Kevin Perry, “The Original Showoff” Mike Paiva, and many more! The Riverside American Legion Hall is located at 830 Willett Avenue in Riverside, Rhode Island. Doors open for this event at 7pm with the action kicking off at 7:30pm. Tickets will be available at the door, $10 for adults and $5 for all kids twelve and under. For more information on Northeast Championship Wrestling, including our 2nd day of wrestling action taking place September 29th in Woonsocket, RI check us out online at http://theNCW.com or like us on Facebook at http://www.facebook.com/NCWwrestling.